I finished my first knitted sock yesterday , it took a total of 5 days , i don’t know how many hours , i don’t know how many stitches . I don’t always knit either because i had things to do such as working out , homeschooling my son and cooking and cleaning , and all those things . I do most of my knitting at night time , or whenever i get a chance even when i had to stand up waiting for some few things to finish . So , after working out yesterday morning , while listening to my son reading History out loud and checking his work on vocabulary , as well as him studying his Skeletal System , i was there standing up by the kitchen counter and knitting my sock . Without i know it , it looked pretty darn long and i thought i better try this on . Thank goodness i did , because it was right UNDER the big toe .. even my pinky was covered up . That means , i need to start decreasing and making the toe area . That’s how it looks like when i started to decrease to make the toe . 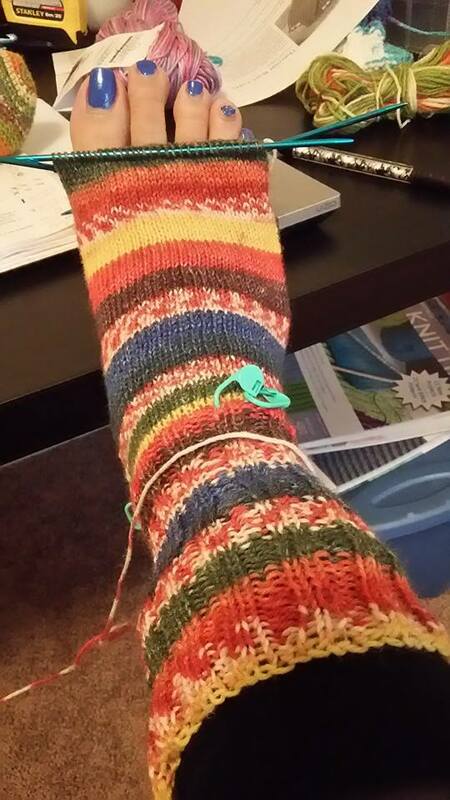 I decided to end my sock with 3 bind off needles , instead of what the pattern asks which was a kitchener stitch . I did a kitchener stitch with one of my big thick sock , but i must have done something wrong because there was 1 stitch hanging out lose .. so it was too scary for me to use kitchener stitch again . Now that i learned an easier bind off method . Can’t really say 3 binds off needles is easy actually , the hard part was trying to put the stitch in the back in front of the stitch in front . Just like regular binding off , it’s hard when your yarn is so fine and the needle is so small . I ended up using crochet hook to pull the yarn and it worked better for me . 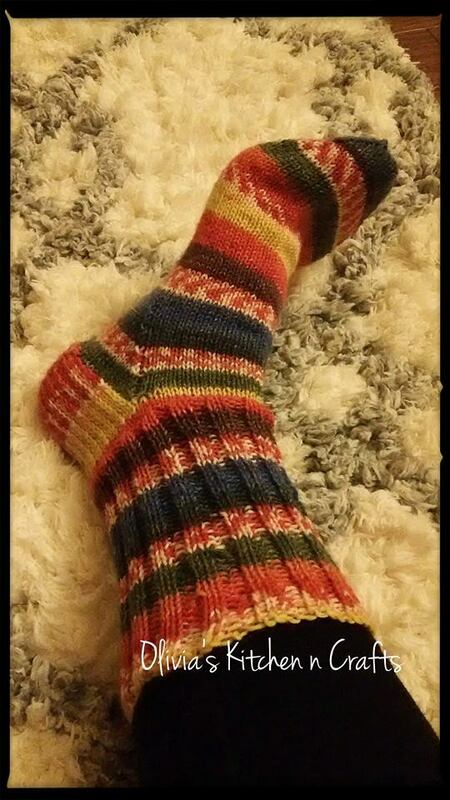 Here is the final result for my first knitted sock . I really do like the way it looks , sock yarn is awesome !! 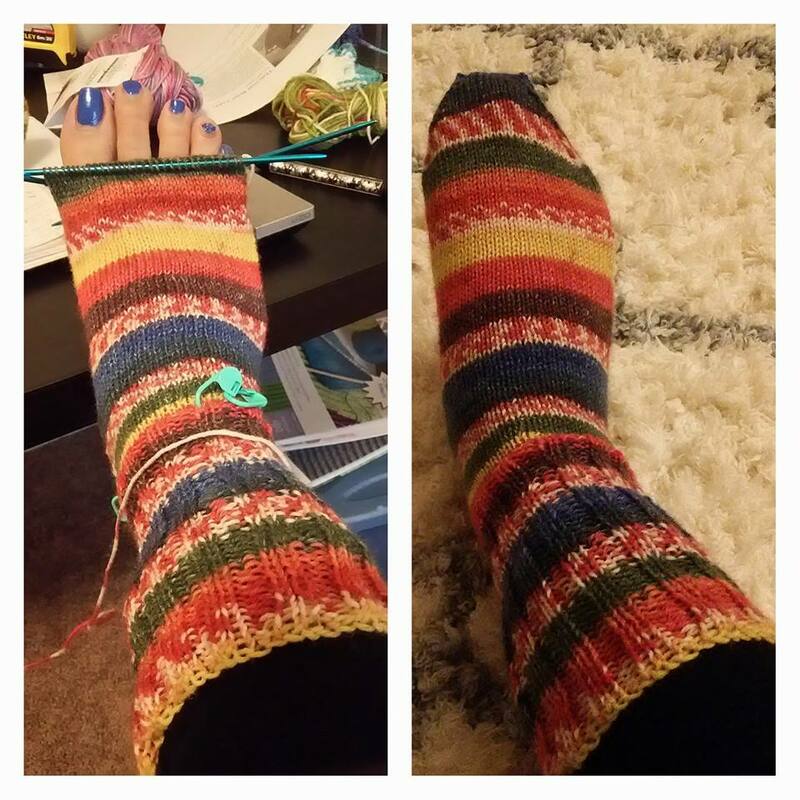 The pattern that i use was a pretty basic sock , and i am already so happy with how it looks . Not only the look , but knitted sock definitely stretchier compared to crochet sock . Now started on my other half pair .. before the second sock syndrome hits me .. hopefully i can complete the other half within 5 days as well . 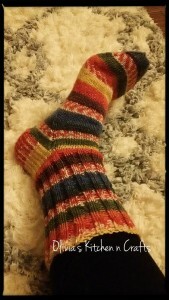 ← Knitting sock is addicting !